Ce document au format PDF 1.4 a été généré par PDFCreator Version 1.4.1 / GPL Ghostscript 9.05, et a été envoyé sur fichier-pdf.fr le 28/10/2014 à 12:47, depuis l'adresse IP 194.204.x.x. La présente page de téléchargement du fichier a été vue 268 fois. Taille du document: 2.1 Mo (10 pages). will bring honor to our disciplines. I wish good luck to all participants! 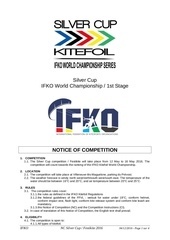 welcome again this world competition. 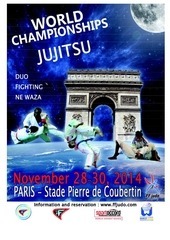 disciplines, DUO SYSTEM, JUJITSU COMBAT and JUJITSU NE-WAZA. Welcome to Paris and good luck to everyone ! Bienvenue à Paris et bonne chance à tous ! the reservations will be the 20th of October 2014 (included). fees / person for penalty ! breakfast and the lunch of the day after ! Additionnal meal can be order (before the arrival) : 20 € / meal / person. payment will be made by e-mail. LCL by 20 october 2014.
refund on the bank account of a requestor with 8 working days. 6. Hotel check-in time is 14:00, check-out time is 12:00. 7. Early arrival from 00:00 to 12:00 is charged as a full day. Breakfast is provided. after 18:00 will be charged as a full day. 11. Preferences and special requests will be considered and satisfied if possible. etc.). Under the condition that the reservation was made in the times. plane and at the customs control). Possible reservations of extra rooms at the check-in will also be surcharged with 10%. 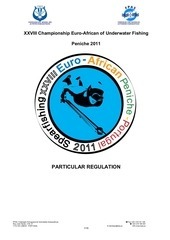 bank transfer costs are to be paid by the participation federation. delegation shall be charged to federation and paid in full. calendar days after the invoice is issued. the same line of tramway, metro station or nearby. Nations missing the registration deadline will not be allowed to start. Hotel reservations from 1st september 2014 to 30th october 2014.
deadline no additional persons can be added. only in the case of an injury. accreditation card should be carried at all times. 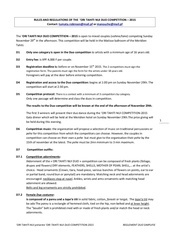 Each competitor must pay 85 euros for his participation to the WC Jujitsu 2014. Referees are appointed by JJIF Refereeing Commission. maximum of three (3) delegates per National Federation will be authorized. b. Backnumber : backnumber will be proposed by organizer. observed, inclusive the Dress Code. finales), will have to wear a proper clothing (dress code). will have to wear a national jogging. Draw of the four medal winners (8 controls for each day). request for a booking sheet to the Organizer. numbers, date of birth, and positions. 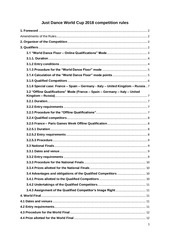 Jujitsu Federation, as well as the WADA (World Anti Doping Agency) rules. won a medal has to attend the ceremony to receive their medal in person. identification other than the one represented in the regular manner on their equipment. so is wearing a cap or any other head cover. Ce fichier a été mis en ligne par un utilisateur du site. Identifiant unique du document: 00274679.